Do as I say, not as I do. It’s the rallying cry of a generation of parents who live on their mobile devices yet bemoan their children’s addictive online behaviors. One of the saddest sights I see is a 5 or 6 year old pleading for attention when their parent’s are glued to phones. And yet, there’s a renewed and vigorous discussion about how to manage kids’ online addiction. Like obese parents putting their kids on a diet, something rings untrue. Parents, who understand full well about the Internet’s pull on psyche are everywhere, building solutions, often in the image of their own children’s struggles. Apple investors have been pressuring Apple to pay more attention to the potential for kids to become addicted to their devices. At this year’s World Economic Forum in Davos, Marc Benioff, CEO of Salesforce likened social media to cigarettes, an addictive substance calling for more regulation. George Soros, philanthropist and billionaire used the metaphor of casinos who deliberately engineer addiction into the product. The large social media and search companies aren’t sitting idle. Facebook recently released Messenger for Kids to safely on-board kids into the social media world. Googlers want kids to visit Be Internet Awesome, an primer (albeit a fairly shallow one) that uses gaming to teach kids about what and what not to share on the web. Amazon’s Kindle has some great kid-parent features including unlimited subscription so kids aren’t negotiating purchases, timers and setting for parents and even a “dinner time” devices are off control. Some new companies are trying new solutions. Patrick Chiang, founder/CEO of Empath,developed Elkins, a droid-looking robot who doubles as a text messenger to deal so his daughter could safely message him at work. And Krissy Watry with Dynepic Systems has been working on an ambitious walled garden, a safe place for the whole family. Others are tapping into new technology and dealing with the challenge of kids who log on to devices outside of the home. John Wu’s new company Gryphon , has one of the more sophisticated ideas. He’s launching a 5G mesh router with AI that makes some sophisticated recommendations about appropriate places for your kids to go (and not) on the web. The platform will work both inside and outside of the house with all IoT connected devices, a real step forward. 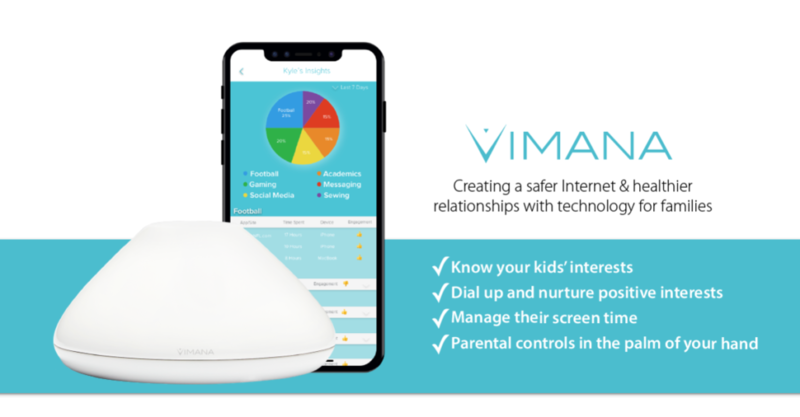 In a similar vein, Sada Malladi CEO of Vimana, let’s you keep your own router but has a small plug-in device for the router that offers a secure portal to monitor your children’s activities and help you understand what it calls an “emotional sentiment” — the amount of time you spend gaming, on social media on academics and more. A parent can then decide, if they choose, to selectively wean their kids from certain activities at certain hours — let’s say gaming or social media. The parent an set a time-reduction plan to reduce gaming by 15 minutes a day. The intent is to make it easy for a parent to decide what’s appropriate activity in and outside the home. Laudable efforts and technical fetes these solutions are missing one thing. Parents aren’t held to the same standard. The only way we’re going to make any headway is for Internet behavior to be a family affair. Tools will work better we the rules we track activities and impose rules for ourselves and our kids. We’re all kids on the Internet, and we should all be using them. The message should be “I’m installing something that will help us all manage our insatiable need for online connection. Yes, to be honest, we are just as out of control as you are. It rings hollow for kids to acquiesce to monitoring when they see their parents giving away personal information like Halloween candy, and feeding their own narcissistic need to believe the world is awaiting their social media update. The subject of the addictive powers of mobile devices has been in studied. One study cited nearly half (49%) of parents felt they had to struggle to find time to play with their children. Another from San Diego State University, which pulled data from over one million 8th-, 10th-, and 12th-graders in the U.S. showed teens who spent more time on social media, gaming, texting and video-chatting on their phones were not as happy as those who played sports, went outside and interacted with real human beings. Online companies want their web products to be “sticky.” But sticky is really just another word for addictive. The more time you spend swiping and tapping on their sites the more they’ve achieved their mission. The architects of systems that serve consumers have a responsibility to them too. The business of protecting kids new technology is typically a noble business. But, parents have a responsibility, too. Since the beginning of the Internet there have been many parental solutions to keeping kids safe. Few parents have spent the money or the time to use them. But, if we treat mobile device issues like a family in a twelve step program, we may start to turn the tide.